where S is the total solar insolation or radiation at the top of the atmosphere, A is the albedo or the fraction of the solar radiation reflected without absorption by the Earth system, and the factor of 4 is the average reduction of solar flux due to the projection of a rotating sphere onto a disk in the daily cycle. So 4ø = 3.5016 for the Earth. So if the present average temperature of the Earth is taken to be 288.2 K, the net warming effect of all of the present infra-red active gases is 9.8 K. This is a far cry from the 33 K warming effect which is often claimed as the result of the so-called greenhouse gas effect. But it is true that without the so-called greenhouse gases, the Earth’s surface would be cooler than it is now because the surface itself would be in radiative equilibrium with space instead of a combination of the surface, a more heavily weighted altitude at the top of the troposphere, and a much lighter weighting of the stratosphere. 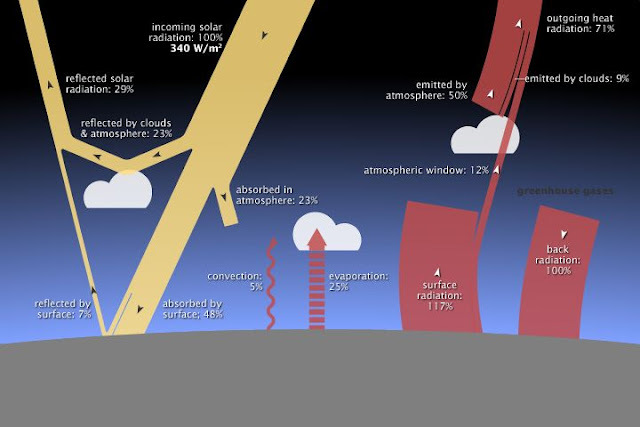 The movement of the altitude of the final emission to space of infra-red radiation upward gives slower energy transport mechanisms in the troposphere the primary task of cooling the surface and warming the lower troposphere. Fig. 1. The NASA Earth Energy Budget of 2013 is shown. There is a great deal of nonsense in this energy budget, but the one thing we are taking from it is the fraction of solar radiation incident upon the surface which is reflected, which is 7% / (48% + 7%) = 0.127. There are many effects that are caused by the infra-red active gases. The first molecules of these gases added to the atmosphere were able to absorb energy that would otherwise have been radiated directly from the surface straight out into space. That absorbed energy was then most often transferred to non-active infra-red molecules of nitrogen, oxygen, and argon gas which then mostly transported the energy upward by convection processes until the energy was deposited in the atmosphere where the molecular collision rate was lower and the mean free path for infra-red energy absorption was longer. This absorption effect is large at first, but becomes rapidly smaller as the number of infra-red molecules becomes larger. Other effects do not shrink as rapidly or at all as the number of infra-active molecules increases, however. For instance, water vapor and CO2 also absorb incoming solar insolation in the atmosphere and that absorption is less saturated at the present concentrations of water vapor and CO2 in the atmosphere. This is a surface cooling effect in that the radiation never arrives at the surface to warm it. The differential effects of water vapor and CO2 compared to N2 and O2 on the heat transported by convection scale linearly with the increase in water vapor and CO2, so they do not diminish as their concentrations are increased. Water vapor condensation in the atmosphere also increases linearly with the amount of water vapor. So, it is not a foregone conclusion that adding CO2 to the present mix of gases in the Earth atmosphere will cause further warming, just because the additions of the first molecules did cause warming. We do not immediately know whether the so-called greenhouse effect is increasing or decreasing with further additions of greenhouse gases. This is a question I have been discussing for years on this blog and since I wrote a book chapter called Do IR-Absorbing Gases Warm or Cool the Earth’s Surface?, in Slaying the Sky Dragon -- Death of the Greenhouse Gas Theory, Stairway Press, published in January 2011. Of course, the presence of water on the Earth’s surface and water vapor in the atmosphere causes the Earth’s surface to be warmer than it would be without water, but unlike the common assumption, this does not tell us that further additions of the so-called greenhouse gases will cause further warming. I have many times explained why the physics commonly and vaguely offered as the reason why such gases would continue to warm the Earth’s surface is wrong. Where Th is the temperature in K at altitude h, ph is the pressure at altitude h, σ is the Stefan-Boltzmann constant, and b is a constant. For Earth, S = 1367 W/m2, the albedo A = 0.3, and 4 ø = 3.5016. Taking the surface temperature TS = 288.2 K, one can calculate the value of bα to be 1.094. For the Earth’s present atmosphere, α = 0.1905.
which is not the way this is expressed in the paper. Note that µN2 cP (N2) is the heat capacity per mole of nitrogen gas and each atmospheric gas component should be handled similarly. cW + cR is the effective heat capacity of the sum of the water condensation processes and the absorption by infra-red active gases of the incoming solar insolation in the atmosphere. A decrease in the value of α will cause a temperature decrease at any given altitude in the troposphere and a temperature decrease at the surface. The value of µ should also be adjusted for additions with a weighted average based on component gas partial pressures as I showed above, though the paper does not present the issue in this way. Additions of carbon dioxide with a mass of 44 amu increase the overall air µ since N2 has a mass of 28 amu and O2 has a mass of 32 amu, with normal air being about 28.96 amu on average. So additions of carbon dioxide will decrease α by increasing the average molecular mass. On the other hand, additions of water vapor (18 amu) or methane (16 amu), both reduce the average air molecular weight, which acts to increase α. To find the overall effect of a gas component in convection, however, one needs to examine the heat capacity of each gas in terms of its µ cP or its constant pressure heat capacity per mole. Unfortunately, the paper incorrectly equates specific heat with heat capacity in the discussion. Specific heats are given in relation to that of water. While they misuse the term, the results are handled correctly. Because the infra-red active gases have internal modes of vibration which are excited and hence carry energy in addition to the translational kinetic energy of these molecules, they have larger heat capacities per mole than do the non-infra-red active gases such as N2 and O2. For instance, at atmospheric pressure N2 has a heat capacity at constant pressure of 6.96 cal/K mol, while H2O vapor has a heat capacity of 8.02 cal/K mol, CO2 has a heat capacity of 8.87 cal/K mol, and methane, CH4, has a heat capacity of 8.44 cal/K mol. The constant pressure heat capacities per mole of water vapor, carbon dioxide, and methane are all greater than those of nitrogen gas, so they reduce the value of α by increasing the convective heat capacity in the denominator of α. A reduced α means a reduced temperature. The paper confuses this issue in the discussion because it gives the heat capacities for each molecule as the heat capacity per gram, which is lower for CO2 than it is for N2 and O2 due to its substantially greater molecular weight. They state the right conclusion, but the reasoning is hard to follow. More water vapor increases both cW and cR, while an increase in carbon dioxide or methane increases cR. So α and the temperature are still further reduced by the increased net heat capacity. The heat energy transport by convection, water condensation, and radiation of infra-red active gases is proportional to the cP, cW, and cR values. Convection is responsible for 66.56% of the heat transfer, water condensation for 24.94%, and radiation by infra-red active gases accounts for 8.51% of the energy transport in the troposphere. The paper uses this methodology to show an excellent match with the surface temperatures and the lower atmosphere temperature gradients for both Earth and Venus. It points out that an all methane Earth atmosphere would have almost exactly the same surface temperature, while an all CO2 Earth atmosphere would have a surface temperature of about 281K, instead of 288K. These are under the assumption that the total weight of the atmosphere is preserved in the comparisons. So, as I have often said, the net warming of the Earth’s surface by infra-red gases is much less than it is claimed to be. It is about 9.8 K, not about 33 K. Also, as I have said by other empirical approaches, the effect of adding water vapor to the atmosphere is now a cooling effect, though water vapor is responsible for most of the prior warming due to its role in preventing a direct radiative equilibrium between the surface and space for most of the heat at the surface. I have also said that adding CO2 has a very small effect on the surface temperature, which is borne out by this paper where CO2 is only responsible for a small portion of the small cR effect and a very small increase of cP. I have long said that it was not clear that adding CO2 would not decrease the temperature a wee bit. It now appears clear that just as adding water vapor now decreases the surface temperature, so too does adding either CO2 or methane gas. This paper I have just discussed shows why additions of the infra-red active (greenhouse) gases now have a net cooling effect upon our troposphere and upon surface temperatures. There is a warming of the surface by infra-red active gases, the so-called greenhouse gases, but that effect was maximized at lower concentrations of those gases than we now have. Increases in those gases now cause small decreases in surface and general tropospheric temperatures. This is because the mean free length for infra-red absorption by these gases is now too short for them to move the upper troposphere radiative equilibrium altitude to higher altitudes in the dense troposphere. With that space radiation shell at the top of the troposphere relatively stabilized, the increased role of the gases in transporting heat energy upward from the surface means they are stronger coolants than they are “greenhouse” heaters. In addition, the less saturated effect of the infra-red active gases in absorbing solar insolation prior to its reaching the Earth's surface is in effect a cooling of the surface. This solar insolation absorbing cooling effect has gained significance with respect to the surface temperature warming effect that was due to the absorption of thermal energy emitted from the Earth's surface and which broke the surface radiative equilibrium with space. The disruption of the radiative equilibrium of the Earth's surface with space is the only important means by which infra-red active molecules warm the surface. This has nothing to do with back-radiation from the atmosphere as I have discussed here, here, and here. A small amount of radiation from the atmosphere is absorbed by the Earth's surface, but only in those local conditions when the absorbing molecule in the Earth's surface has a lower temperature than does the emitting infra-red active molecule in the atmosphere. An example is when a warm wind blows over a cool surface or when photons emitted from a molecule in the air in a sunny area are absorbed by a surface area which is shaded from the sun. This article was updated on 6 August 2015. This is my belated rational analysis of the Supreme Court's 6-3 decision to approve federal tax subsidies for health insurance exchanges mandated under ObamaCare whether they were established by the state or not in the King v. Burwell case. I am not a lawyer. I am simply a man who regards the protection of individual rights as the sole legitimate role of government, as stated wonderfully in the Declaration of Independence. A very limited government consistent with that goal of legitimate government was mandated by the People in the Constitution of the United States of America. The first Supreme Court decision on the infamously falsely named Patient Protection and Affordable Care Act was NFIB v. Sebelius. The NFIB challenged the use of a fine or penalty fee to force individuals to buy only such particular health insurance plans as were approved by the federal government. Congress had insisted at the time of passage of this bill that the individual penalty fee was not a tax. The majority 5-4 decision that upheld the constitutionality of the individual mandate was based on the bizarre claim that Congress had the power to tax. Since the penalty fee was really a tax and was not a penalty fee according to the court decision, the individual mandate was within the powers of Congress to impose. To this day, the Supreme Court designated tax is still called a penalty fee, a fine, and a shared responsibility payment by the federal government, rather than the tax that was falsely ruled constitutional by dropping the context of the taxing power in the Constitution. The power to tax was exlusively for use in exercising the very limited and strictly enumerated powers that promptly follow the power to tax in the structure of the text of the Constitution. If the federal government were allowed to do anything it wants under the power to tax, there was no need to enumerate its limited powers to provide for the national defense, handle foreign affairs, establish a federal court system and a postal system, establish post roads, bankruptcy law, patent law, naturalization law, and uniform weights and measures. Note the lack of any authority to establish health care or health insurance laws. Now remember this lack of context in the case of the Supreme Law of the Land as we discuss this King v. Burwell decision which hangs so heavily on what it claims is context. Basically, the decision concludes that ObamaCare "includes more than a few examples of inartful drafting." Of course those of us who paid attention to the process by which it "became law" understand that it was slapped together with undue hast, without any attempt to rationally evaluate its effects and self-consistency, and without being read by most of those Democrats who voted for it. In fact, we are not sure that a single voter actually read it. But, we do know that a number of those who did thought that only those in states that chose to establish an ObamaCare exchange would be eligible for federal subsidies for health insurance plans on those state exchanges. This was supposed to help convince the state governments to cooperate with the ObamaCare law or get them in trouble with those who would be deprived of the subsidies. The Patient Protection and Affordable Care Act grew out of a long history of failed health insurance reform. It must have guaranteed issue. It must have a community rating requirement. It must require an individual mandate or impose a tax on non-compliant individuals. It must provide subsidies to make the insurance affordable for low income persons. Deciding what successful health insurance reform is might be a legislative power, if it were even that and it is not, but most certainly is not a power granted to the federal courts. Nonetheless, this Supreme Court has decided that this is a part of the context which it will apply as a critical element in its argument that ObamaCare is legal. This is a purely political decision. The decision claims that there is ambiguity in the oft repeated phrase "an Exchange established by the State under [42 U.S.C. Section 18031]" due to context. The dissenting opinion disagrees on this. If the state does not establish an ObamaCare exchange, the Secretary of Health and Human Services is directed to establish "such Exchange." The word "such" is loaded with the meaning that whether the exchange is established by the state or by the federal government, those exchanges are interchangeable for all purposes of the law. Now this is a major case of cherry picking a meaning for the word "such" and loading it with massive interpretive import, especially in the context of a bill which "includes more than a few examples of inartful drafting." That is a form of context-dropping. The court claims that this is providing context, nonetheless. There is also a reference that the act provides that tax credits "shall be allowed" for any "applicable taxpayer." In this case the majority decision chooses to interpret "applicable taxpayer" as one who meets the income requirement but the word applicable does not apply to whether the taxpayer is in a state with an applicable state-established exchange. Well, who knows what this means? It is a badly written bill, full of "inartful drafting." There is also a reference that directs all exchanges to make an effort to inform individuals about the subsidy program. Politically, this was known to be a part of the effort to bring pressure on states to establish an ObamaCare exchange. If they did not do so, the federal exchange would broadcast to those who did not get the subsidy what their state had taken from them and put pressure on the state to cooperate with the law to reduce its costs to the federal government by creating and managing the exchange. It did not work out this way because so many states refused to set up state exchanges that the Obama administration had the IRS rule that subsidies would be available in all states. This was needed to tamp down the rebellion. With the claim that there is ambiguity, the court says that the issue is so loaded with "economic and political significance" that Congress could not have intended that the interpretation be provided by the IRS. So, the Supreme Court concluded that the interpretation should be provided by the Supreme Court with all of its expertise on economic and political issues. A rational individual would conclude that if this really is ambiguous, then the Supreme Court should defer to Congress and announce that this critical provision in the ObamaCare law is ambiguous and unintelligible. It should say if Congress wants the federal courts to enforce a health insurance reform law with subsidies, then it is the duty of Congress to eliminate the ambiguity by passing a new law to remove that ambiguity. It is critical that laws have intelligible meaning. But no, there is no deference to Congress and the separation of powers, not even in the context of the incredible change in the Congress resulting from the people's fury over the passage of the ObamaCare law. This court does not want the new representative resulting from democratic choice of the people to have a say in the correction of the faults of the ObamaCare law. Clearly, the Progressive Elitist view of the Supreme Court is stronger than that of the present Congress, so the decision must stay in the Supreme Court to insure their desired political and economic outcome. This court ruling has also had the effect of much further reducing the power of state governments. Their refusal to participate in a federal program which many of them thought correctly was unconstitutional and unworkable was swept aside. These state governments were not to be allowed to protect their residents from any of the many harms of the rightfully unpopular ObamaCare law. The Supreme Court ruled that there was to be no opting out of the health insurance reform bill which it had decided was a politically and economically highly desirable reform. The Supreme Court has once again defied the Constitution, rational law requirements, the democratic expression of the People, and our sovereign individual rights to life, liberty, property, self-ownership, and the pursuit of our happiness. 20 Years of Materials Analysis by Anderson Materials Evaluation, Inc.
Today is not only Bastille Day, but it is also the 20th Anniversary of the founding of Anderson Materials Evaluation, Inc. For 20 years we have been providing high quality materials analysis and characterization services in our laboratory to our discerning customers. We want to thank you for using our analytical services and for making it possible for us to enjoy solving many challenging and fun materials problems, while helping you to improve your products and processing operations. The founder, Dr. Charles Anderson, wants to thank his business partner, Dr. Lorrie Krebs, for her many years of highly dedicated effort in making this 20-year record possible. He wishes to thank Dr. Kevin Wepasnick for his great contributions for the last several years, all of which have been during the on-going Obama Socialist Recession. Many other employees have made great contributions in the earlier years, which are also much appreciated. Many interns have both given us the pleasure of teaching them the science we love so much and have contributed to our work in most cases quite ably. A federal judge has ruled that the Washington Redskins cannot be allowed trademark protections for the name Redskins because that name is offensive to some native Americans of ancient stock and apparently to many Socialist Elitists. This ruling was not impeded by the fact that one of the states of the union, Oklahoma, has a name meaning Home of the Red People, which was given to it by native Americans. It is somewhat offensive by means of the omission of far more essential and important characteristics whenever anyone is identified by the color of their skin. Despite this, federal government forms, forms for government contractors, many forms for sub-contractors of government contractors, and many forms of local governments all require that individuals be identified as black, Hispanic, white, Asian, or some other descriptors of groups indicating ethnic ancestry. The black and the white descriptors are clearly both based on some crude approximation of skin color, just as redskins is. On these federal forms, Reds are allowed to check a box with the somewhat more dignified identifier of Native American. Asians are not forced to check a box that says Slanty-Eyed or Yellows. It is not any of the government's business what my skin color is. No law and no government action should ever be conditioned on the color of anyone's skin or on their ancestry. There should be a complete separation of state and skin color. What is more, I am not white. I am too healthy to be white and I am not a ghost. So stop offending me by calling me white. If you cannot think of any way to describe me but as white, then have the common decency to say nothing at all about me. That would be a proper admission that you were either not interested in me or you knew nothing about me. It is your right to know nothing about me and it is your right to be uninterested in me. I am fine with that. But do not call me names implying I am an insubstantial ghost. Now, back to the Washington Redskins. I am fine with this judge's ruling provided it is based on a general principle that government will not identify any individual by their skin color or some general approximation to it. Unfortunately, our governments and the Socialist Elitists who mostly control them do not recognize moral and political principles in most cases. They do not feel compelled to act consistently upon a rational and coherent moral and political code of principles. This case on the trademark protections of the Washington Redskins name is a case in point. Until and unless the government treats this issue as a general moral and political matter of principle, I will continue calling the Washington Redskins, the Washington Redskins and Oklahoma, Oklahoma.